Content Editor of AxCMS doesn’t work correctly using Internet Explorer 9. Some of the functions cannot be used anymore and there are problems adding texts and other elements to a page. 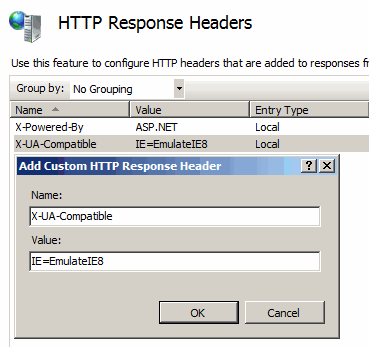 To workaround these display issues, it is possible to make configuration changes in IIS so that special instructions are sent along with the HTTP response, telling IE9 browsers to display the data the same way IE8 would. This will then automatically cue Internet Explorer 9 to use the desired Compatibility settings so that your web application continues to generate web pages which are correctly displayed even in the latest version of Internet Explorer.